The demolition of Palestinian-owned homes and structures in Jerusalem is on the rise, the United Nations Office for the Coordination of Humanitarian Affairs (OCHA) in occupied Palestinian Territory reports. As of June 30, OCHA identified a 12 percent increase in demolitions in East Jerusalem over the first half of 2018, despite a 22 percent decline in demolitions across the occupied territories during the same period. In June all but two of the 22 Palestinian-owned structures demolished by Israeli forces were in East Jerusalem. Thus far, Israeli authorities appear to be continuing to target Palestinian homes for demolition in Jerusalem and its outskirts in July. Israeli forces demolish the Shawmreh and Abu Rameilah families’ homes in Beit Hanina, July 19, 2018. Photo credit: Afif Amira for WAFA. On Thursday, July 19, two Palestinian families demolished their four homes in Beit Hanina in order to avoid paying demolition fees to the Israeli municipality and the prospect of Israeli settlers living in their homes. The homes were built about 20 years ago. The Israeli High Court claims that the homes, which belong to the Shawamreh and Abu Rmeilah families, stand on land owned by Israeli settlers. The Israel Land Fund – a non-profit that aims to acquire “all the land of Israel for the Jewish people” – obtained control of the plot following a court decision six months ago and has since sold it to Israeli buyers, Reuters reports. Some family members are reportedly currently living in a tent adjacent to where their homes once stood. Jamal Hadia demolishes his house in Silwan, July 18, 2018. Photo credit: Wadi Hilweh Information Center. On July 18, Jamal Hadia demolished his house in Silwan to avoid paying demolition fees to the Israeli municipality. He told the Wadi Hilweh Information Center that though his home is 25 years old, five years ago the Israeli municipality claimed it lacks construction permits. Since then, he appealed to the Israeli high court to save his home, but recently received a court order stipulating that he demolish it before July 26 or else pay between 100 and 120 thousand shekels in fines. His family housed nine people. On July 2, Israeli forces demolished a parking lot owned by Mousa Azmi Dweik as well as the roof to a store in Silwan. On July 17, Israeli forces demolished the home of Saleh Abu Khdeir in Shuafat in addition to his fence and barn. Israeli forces did not allow him to retrieve his belongings before carrying out the demolitions. Abu Khdeir told Ma’an News that he received no notice of an impending demolition. He rebuilt his home and barn recently following a prior Israeli demolition of the structures in February 2018. Israeli authorities claim the structures were built without a construction permit. Israeli forces demolish the roof to a Palestinian apartment in A-Tur, July 18, 2018. Photo credit: Wadi Hilweh Information Center. On July 18, Israeli forces demolished the roof to a fifth story apartment in A-Tur. The apartment belonged to the Abu Asbeitan family, the Wadi Hilweh Information Center reports. The day prior, on July 17, Israeli forces demolished a fence protecting Palestinian-owned land in A-Tur. Palestinian neighborhoods in Jerusalem are the target of Israeli settlement plans, which aim to link four concentric circles of settlements, starting with the Old City, followed by the “Holy Basin” (Silwan, Sheikh Jarrah, a-Tur, Mount Zion, and the Kidron Valley), Jerusalem’s annexation border, and finally the West Bank. The recent wave of Israeli demolitions in and around Jerusalem suggests that US President Donald Trump’s decision to transfer the US Embassy from Tel Aviv to Jerusalem has emboldened Israeli authorities to realize these settlement plans. Israeli forces raze land in Khan al-Ahmar, July 4, 2018. Photo credit: Suleiman Abu Srour for WAFA. Though according to OCHA, rates of demolition in Area C of the West Bank have overall decreased, Palestinian villages in Area C near Jerusalem’s annexation border appear to be targeted by a swift succession of demolitions this month. Territory designated as Area C in the West Bank is under the full control of Israeli civil and military authorities. On July 5, Israeli forces demolished four structures in Hizma – one store and three farm stands. Israeli authorities claim the structures were built without permits. The day before, on July 4, Israeli forces demolished nine homes and three agricultural buildings in the Palestinian Bedouin community of Abu Nuwar, displacing 62 people. 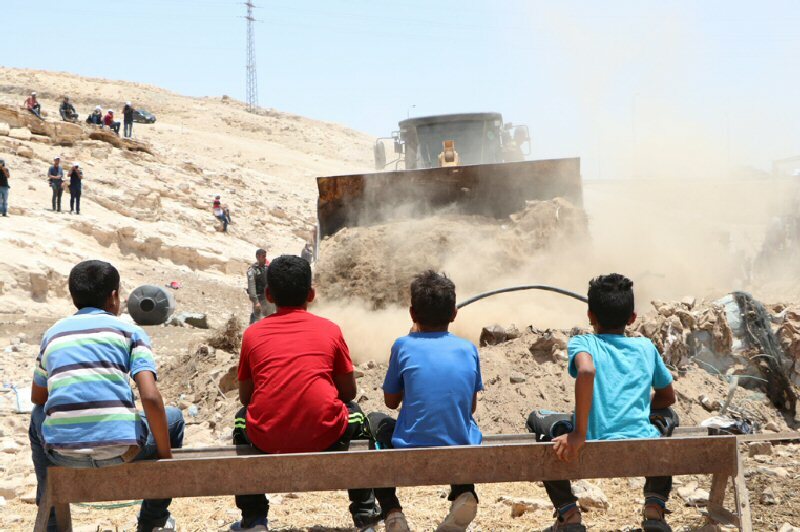 Israeli authorities also delivered demolition orders to Khan al-Ahmar, a Palestinian Bedouin community located on the eastern outskirts of Jerusalem on July 3. On July 12, residents secured a court injunction postponing the demolition of the village until mid August. The destruction of Khan al-Ahmar would displace 180 people. Palestinian villages slated as Area C around Jerusalem are at heightened risk of forcible transfer due to Israeli plans that aim to settle eastern Jerusalem (the E1 corridor) and thereby connect Ma’ale Adumim settlement in the West Bank to Jerusalem. These plans are key to maintaining what Israeli authorities euphemistically call a “demographic balance” in Jerusalem (i.e. restricting the Palestinian population to 30 percent of the city’s total population), and to dividing Palestinian cities, towns and villages into restricted enclaves flanked by settlements on all sides. Between 2010 and 2014, OCHA found that Israeli authorities approved just 1.5 percent of Palestinian building applications in Area C.
Ahmad Jaradat is Senior Project Coordinator at the Alternative Information Center (AIC).